The refashioning of Ukraine’s commemoration of the Second World War away from the Soviet-style ‘Great Patriotic War’ rhetoric towards a more European narrative (starting in 1939 with the Soviet and Nazi invasions of Poland, and not in 1941 with the Nazi invasion of the USSR); the introduction of a holiday of ‘remembrance and reconciliation’ on 8th May alongside the more traditional 9th May Victory Day. The opening up of the archives of the Soviet organs of state repression (KGB, NKVD etc.) and improvement of their accessibility to researchers and the public. The enshrining in law of the status of ‘fighters for Ukraine’s independence’ – a list of groups and individuals from the 20th century that fought for an independent Ukrainian state, including some controversial organizations and figures (notably, the Organisation of Ukrainian Nationalists (OUN), which is criticized for its xenophobic ideology and collaboration with the Nazis during the Second World War, and the Ukrainian Insurgent Army (UPA), which is criticized for perpetration of violence against Jews and Poles during the war). The condemnation of the Nazi and Soviet Communist regimes and the banning of their symbols (this has been the most visible part of the new legislation, as it has involved the mass removal of Soviet monuments from Ukraine’s public space and the mass renaming of places). More information can be found on the UINR website here. The full text can be read in English here and here. 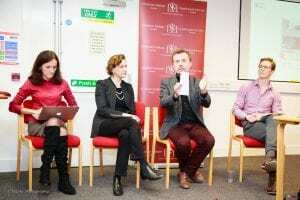 Panelists Alina Shpak, Anne Applebaum and Andrii Portnov; chair Uilleam Blacker. Photo by Zoriana Climenco courtesy of Ukrainian Institute London. The event began with a short film on ‘decommunization’ by students of the Journalism School of the Ukrainian Catholic University in L’viv. The film, ‘Zhyvi i neskoreni’ (Alive and undefeated’), tells the story of two choirs in the small town of Chervonohrad (the first in Ukraine to pull down its Lenin statue), one specializing in patriotic Ukrainian songs and the other in nostalgic Russian/Soviet ones. The film demonstrated in a subtle and humorous way the complexity and ambiguity of the attitudes to the past of many in Ukraine today, even in supposedly nationalistic western Ukraine. The first speaker of the evening was Alina Shpak, who gave a detailed outline of the policies, their motivations and progress so far. She spoke about the archives law and the commemoration of World War II, and presented an overview of the removal of Soviet statues, outlining exactly which symbols and objects fall under the ‘decommunization’ policies and discussing the processes by which changes in place names occur (local authorities are given a certain period in which to change names that fall under the laws, after which central authorities can step in). Shpak also aimed to dispel what she saw as misconceptions about the new legislation. First, she argued that the state is not pursuing a policy of compulsory glorification of nationalist leaders and organisations such as Stepan Bandera and the OUN (Bandera led one branch of the OUN): the government, she argued, has not funded any monuments to Bandera, while the UINR has not held any recent events dedicated to him. Commenting on the laws (which guarantee the OUN’s status as fighters for Ukraine’s independence among a long list of others), she insists that the laws do not force Ukrainians to ‘idealise’ those on the list of ‘fighters’, but that their struggle should be recognised as ‘legitimate’. She also pointed to the Institute’s efforts to build bridges between Polish and Ukrainian historians in relation to difficult historical questions. On the fears over the introduction of criminal responsibility for denying the legitimacy of the struggle for independence, Shpak asserted that interpretations of the law in this way were incorrect. The second speaker, Andrii Portnov began from a discussion of the name change of his native Dnipropetrovsk to Dnipro (removing the reference to the Soviet functionary Hryhorii Petrovs’kyi, who was involved in collectivisation in Ukraine at the time of the artificial famines of 1932-33). Most locals opposed the name change, but their reasons were a fear of the practical inconvenience it might entail or their feeling that the new, shorter name ‘Dnipro’ did not sound serious enough. Only a tiny minority of those asked in polls were aware of the political origins of the city’s name. Portnov discussed the question of whom to replace Lenin statues with, and recent street naming strategies, as well as the difficult question of ‘who decides’. Figures honoured in street names have ranged from nationalists like Bandera to John Lennon and Vaclav Havel, and have included non-Ukrainians. Portnov finished off by suggesting that Ukrainians might begin to think about the Soviet regime as not entirely imposed from Moscow, but as something for which they need to take responsibility: Ukrainians would benefit from a ‘painful discussion’ of Ukraine as a potential successor to the USSR, which could also challenge Russia’s claim to be the sole inheritor of all that is Soviet (including Soviet achievements such as the victory over Nazism). (For a longer analysis by Portnov see here and here). The final speaker, Anne Applebaum, noted that similar processes of reckoning with difficult pasts affect almost all countries (for example in relation to Australia’s treatment of its Aborigines, or the USA’s discussions of the history of slavery). Applebaum described Poland’s attempts to come to terms with its Communist past as ‘complicated and messy’, but noted that this can be positive, as it meant that a multitude of actors were engaged in the process, not only the state. Applebaum argued that uncovering the crimes of totalitarian regimes and underlining a society’s status as a victim was not a guarantee of the development of democracy (‘simply the act of the state building up a memory doesn’t necessary change anything’), and that such processes had to involve an element of civic education. Applebaum also noted that it is dangerous to negate all elements of a period of the past that is seen as negative, since it involves denying the positive, often private memories that people may associate with that period. She concluded by suggesting that the politicization of memory problems was unwise, and that these questions had to be the object of open debate and diverse discussion rather than of the political imposition of a state narrative. Applebaum praised Ukraine for the level of openness of the former Soviet archives, which had attracted many researchers unable to access similar information in Russia. (For more by Anne Applebaum on Ukraine’s history see here). The evening was rounded off by a lively discussion in which questions from the public touched on the problem of potential threats to free speech represented by the laws; the status of the Communist Party of Ukraine (currently fighting a court battle to keep its name, but not, according to Shpak, banned as an organisation as such); the possibility of not replacing Lenin statues at all; the problem of dismissing the entire Soviet period as ‘totalitarian’ (both Applebaum and Shpak insisted that the Soviet regime even in its later, less repressive incarnations still deserved condemnation); the role of education in the processes of re-assessing the past (Shpak regretted that the Institute did not have greater resources to pursue such activities, though it did have some initiatives). The public discussion turned also towards the question of Ukraine’s remarkable diversity in terms of language, religion, national identity and also perceptions of the past. While one member of the audience questioned how ultimately productive such a chaotic and often antagonistic plurality was, Portnov, while accepting that it was far from ideal, insisted that it was still better than an imposed unity.